New Orleans, LA plastic surgeon Dr. Jules Walters performs a full spectrum of facial surgical treatments. One of the most sought out surgeries at Walters Plastic Surgery is a facelift. This surgery focuses on distinct areas of the face to tighten loose skin and wrinkles to create a more taut, yet softer appearance. Based upon your concerns and goals for surgery, a facelift can focus on the lines and wrinkles near the eyes, the mid-face area and cheeks, and the bottom two-thirds (including the mouth, jowls, neck, and more) for an all-encompassing younger look. 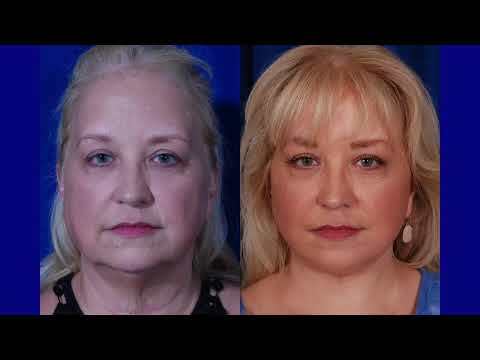 The facelift technique used depends on your desired outcome, the health and condition of your skin, the degree of skin laxity, your lifestyle, age, and anatomy. Some individuals are of age and have skin laxity for a full facelift, while some may only be ready for a lower face lift. Dr. Walters is a highly trained and experienced surgeon who understands the complexity and delicate anatomy of a facelift procedure. The overall goal is to produce a natural appearance that's gorgeous, subtle, and still striking. Men and women who are suitable for facelift surgery are frustrated by drooping skin, lines, and wrinkles on the face whether it be the face as a whole or on the upper, mid, or lower face. A facelift can target one or more areas depending on your unique goals and desired outcome. It's also important to note that age doesn't always define the time in life to have a facelift treatment. There are countless aspects and factors, and also numerous lift techniques depending on the cosmetic concerns of the patient. The lifting technique chosen will be different for patients who are between 30 and 40 years old vs. those who are older, such as 60 or 70 years old. The condition of the skin is one of the key elements in the decision-making process. Patients should be physically healthy, be a non-smoker, and also have expectations that are realistic. "I was referred to Dr. Walters by a friend. Her face looked natural, pretty and youthful. At my appointment with Dr. Walters we discussed my wanting to improve my looks. At this time I could not afford a facelift. Dr. Walters understood which areas I was concerned with. He suggested fillers. I am more than excited over the way my cheeks and lips look with fillers. I feel I look the best I've ever looked, and at 65 I'm thrilled with the results." "Amazing Doctor! - Dr Walters is by far the best plastic surgeon I’ve ever encountered. His professionalism is impeccable and since meeting him in 2015, I haven’t seen another plastic surgeon. I live in Europe, but schedule my filler treatments around my trips to the states. My mother is also a patient of his and received a facelift, 2 years ago, and still looks beautiful. When it comes to my fillers and Bot..."
"Facelift - New Orleans, LA - Dr Walter is great. Very comfortable and easy to talk to and ask question? Fantastic work." A common surgery for older adults, the full or "traditional" facelift most often incorporates an incision close to the hairline, extending down to the area near the temples, stopping near the base of the ears. The deeper layer of facial muscles is carefully stretched and safely tightened to create a lifted outcome, which reduces excessive loose skin and droopy features. This facelift is used for individuals who have visible signs of aggressive aging. During a full facelift, various treatments may be used, including blepharoplasty to address the eyes or neck lift for the lower region. With a similar approach to the mini facelift, the surgery known as mid-facelift addresses the hollow and lax areas close to the cheekbones as well as the upper jaw. The mid facelift works well for those who hope to attain improvement of the middle to lower region of the face, which also improves the look of the jowls. This lift corrects the chin area and neck and sometimes the jowls. Methods of a nonsurgical nature, such as a Kybella injection, can also be applied for to attain a younger, tighter-looking neck. When undergoing a mini facelift, a thin, small incision is placed near the ears to lift the skin to a higher position, which enhances the mouth, jawline, and jowls. This process creates nice and subtle enhancements that look beautiful and natural. No matter which facelift technique you undergo, the primary goal is to produce a gorgeous and visually appealing result. Facelift surgeries are often completed with local anesthesia, IV sedation or general anesthesia. The duration of the procedure depends on the invasive nature of the procedure, and also if other surgeries were combined. Following your procedure, there will be bruising and swelling, slight to moderate pain, and soreness, which can be relieved by pain medication. Many patients feel and physically look better after several weeks. You can expect a more glowing look with fewer lines and less sagging. Overall, the face will appear lifted and younger looking. Cosmetic facial surgery can turn back the hands of time for your face and give you a glowing appearance. Thankfully, there are a wide variety of choices for surgery depending on your unique needs and goals. This surgery is meant to elegantly and seamlessly help take you through each decade looking natural. For more information, we welcome you to get in touch with Walters Plastic Surgery in New Orleans and Metairie, LA to schedule your appointment with Dr. Walters.